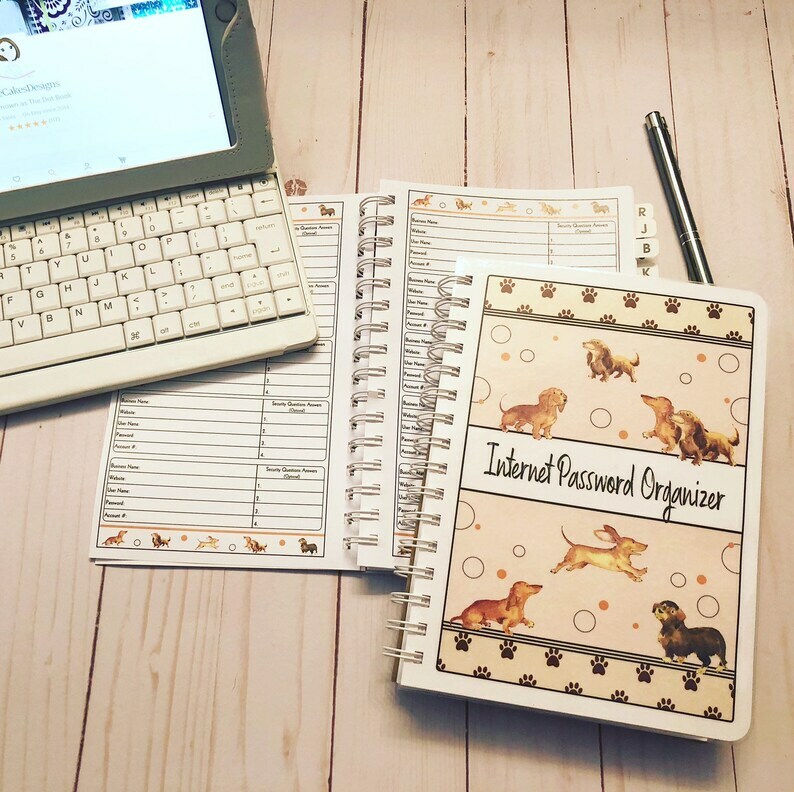 Stay organized with this handy adorable Internet Password Organizer! This features beautiful watercolor Dachshund artwork throughout. This is a soft cover, spiral bound book and is 6" x 8.5" (inner pages are 5.5 x 8.5”"). Pages are high quality bright white paper. Cover and alphabetical divider pages are heavy cardstock. Front Cover is laminated. Back cover is chipboard. There are 4 pages per letter with 5 listings per page. X-Y-Z pages are combined and have 6 pages. **Because some people don't like to announce that this is where their passwords are stored this book comes with the option of having the wording removed on the front cover, keeping it as shown in the picture, or you can personalize it with a name. If you want it personalized , choose the "Add A Name" option and you will have to put the name that you want in the 'NOTES TO SELLER' portion of checkout. Be sure to check spelling (I copy and paste as you have entered it) and please don't use ALL CAPS. Matching Address Book is also available. Other cover designs are available, see my other listings. Shipping: This item will ship via USPS First Class Mail. Since all items are made to order I do not offer refunds. I will not be responsible for misspelled names on the cover if you have chosen to personalize it. THIS IS NOT AVAILABLE FOR INSTANT DOWNLOAD. Notice: These books are my own unique design and ideas and are Copyright Protected. Copying the format and designs will be reported. I cannot find any other appointment book like this! It’s perfect! Exactly what I need! And at such a reasonable price too!! I offer personalized and custom order requests at an additional fee of $10 and up based on the level of your request. Please message me for more info. I can no longer do any custom work without payment up front.